A group of innovative animal protectionists developed a process called Trap-Neuter-Return, most commonly referred to as TNR among those in the field, to provide a better solution to the incessant killing that was the non-working “solution” for feral cats. 1. Trap: the individuals involved humanely trap all of the cats in a colony. They use traps that do not hurt the cats and allow them to be transported safely. 2. Neuter: the trappers bring the cats to a veterinarian (this is pre-arranged) to be spayed or neutered, vaccinated and “eartipped.” Eartipping means snipping off a tiny piece of the cat’s ear (remember the cat is under anesthesia when this is done) and serves as the universal symbol that the cat has been spayed or neutered. This means the cat will not be trapped again for that purpose. 3. Return: After a short recovery period, the cats are returned to the exact spot where they were trapped so that they can resume their lives. People performing TNR fall into three general categories: nonprofit organizations dedicated to feral cats and TNR, animal shelters and humane societies, and individuals.The first two may accomplish the work through staff and/or volunteers. 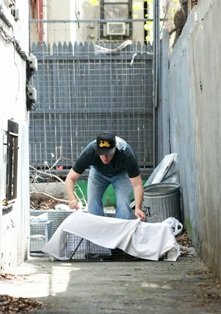 The individuals involved in TNR have taken it upon themselves to take care of the feral cat colonies on their property or in their neighborhood. TNR providers plan and prepare for their trapping efforts taking numerous factors into account, such as the site, the number of cats to be trapped, transportation, spay/neuter appointments, equipment needs (traps are sometimes available for loan or rent from other TNR providers in the area). First-time TNR providers learn about the process (several non profits have excellent information on their websites and other material) before starting and ideally seek the assistance of those with more experience, if available. TNR efforts are most effective when the targeted trapping is employed, meaning that entire colonies in a single area are trapped rather than a handful of cats from several colonies throughout a larger geographical area. If only a portion of the population is spayed and neutered, they will continue to reproduce and prevent the colony’s population from stabilizing. Feral cat caregivers don’t stop once they return the cats to their outdoor homes. The caregivers that employ “best practices” for colony care enhance the lives of the cats under their care to an even greater degree and help ease any tensions in the neighborhood. Finally, community education is critical to ensuring the well-being and safety of feral cat colonies. Unfortunately, so many myths and untruths surround feral cat colonies that caregivers often need to undertake community education at outreach at the same time as the hands-on caring for the cats. While this can take time and effort, the payoff is tremendous and is key to the success of TNR.